Over the past fifteen years, digitization has completely revised archival work. Digital texts introduce novel means of encountering the past because they simultaneously exist materially and ideally; everywhere and nowhere; in the past and the present. As NINEs and BRANCH founder Dino Felluga argues, ‘our current postmodern age tends toward dematerialization’ (308), or what Alan Liu of RoSE and Transliteracies calls ‘unit-detail atomism’ (84), suggesting that online archives are postmodern by virtue of their near-limitless compass. This ineffability complicates the ethics of access because images can be downloaded, remixed, repurposed, and, of greatest concern to scholars, divorced from their historical and social framework. Yet this critical divorce is not completely or even necessarily pernicious. Digital archives enable unrestricted imagination often by materially separating text from context. For this reason online, and thereby virtually universal access, forces scholars to revisit the longstanding antagonism between creative liberty and critical analysis. In fact, Victoriana’s archive-enabled creative reinventions, however uncritical, nostalgic, and historically imprecise, may actually revitalize the nineteenth-century in ways academics cannot fully anticipate. Digital humanists labor under the same assumptions as Neo-Victorians in respect to reinscription. For Neo-Victorians the tension between creation and nostalgia or repackaging and interpreting afresh is particularly compelling. Mark Llewellyn says the neo-Victorian, ‘is ultimately a kind of palimpsestuous vision’ (171). Both analyze the nineteenth-century from the present, but waver on whether decoding the Victorians moves beyond the critical to become wholly creative inscription. As Steampunk author and self-described cut-and-paste artist (a nod to William S. Burroughs’s ‘cut-up method’) William Gibson says, the ‘remix is the very nature of the digital.’ While the line separating Gibson’s ‘recombinant (the bootleg, the remix, the mash-up)’ and outright plagiarism is an ethical conundrum in its own right, some nineteenth-century scholars hesitate to embrace the Neo-Victorian because extreme ideological significance renders some ideas resistant to remix culture. For instance, it seems unlikely that even a virtuoso collage or remix artist can positively reclaim Galtonian eugenics. While this is an extreme example, ethics blur the palimpsetic line separating nostalgia and hagiography from imaginative reinvention. As editor of Visual Haggard: The Illustration Archive, I have often reflected on the creative and critical razor’s edge afforded by the digital archive. Intended to centralize, annotate, and improve access to the illustrations of H. Rider Haggard, Visual Haggard suggests several ways in which digitization can augment Victorian literary and cultural studies. But the illustrations from Haggard’s nearly fifty novels are often difficult for twenty-first century viewers to stomach—and understandably so. Much contemporary discomfort comes from the illustrators’ depictions of non-white natives and women. Haggard’s illustrators frequently show white ‘heroes’ killing brown ‘villains.’ Some images present women, commonly in a stage of undress, objectified to accord with European male fantasies of exoticism. Is it imprudent to make Haggard illustrations available online where they are liable to become recombinants? Can contemporary artists and critics successfully reclaim the Zulus, Hottentots, Kafirs, and Amahaggar dehumanized repeatedly in Haggard illustrations? Visual Haggard’s texts cannot and should not remain in obscurity because of their creative and critical potentialities. It is the archivist’s duty to make these texts available, and the academic’s duty to contextualize them in metadata appropriate for scholars and laypersons alike. 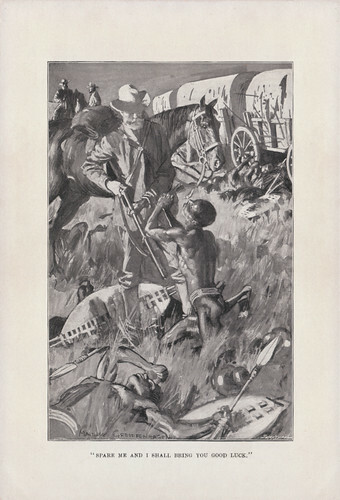 In Swallow (1899) a Kaffir slave named Gaasha kneels surrounded by dead Zulus and pleads for his life from an armed Boer. In Maurice Greiffenhagen’s illustration ‘ “Spare me and I shall bring you good luck,” ’ the African is pictured visually lower than the whiteman (Fig. 1). 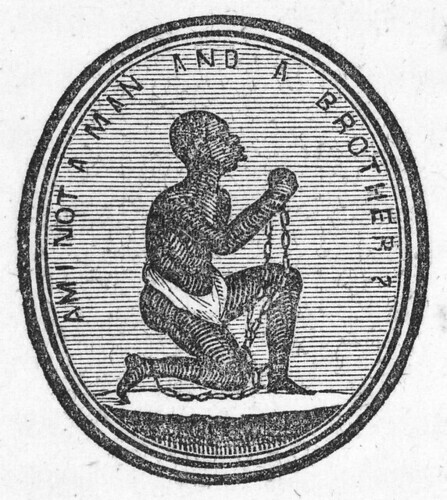 He petitions for mercy in an attitude not dissimilar to Josiah Wedgwood’s sentimental African slave depicted in the eighteenth-century abolitionist emblem ‘Am I Not a Man and Brother?’ (1787, Fig. 2). Both men’s hands are clasped and their backs are presented submissively as they plead for the white man’s mercy. Haggard’s narrative makes Gaasha sympathetic, and Greiffenhagen renders his musculature as almost Greek in perfection, all without disrupting a racial hierarchy made visceral because visual. Yet, what remains less clear and therefore fertile ground for critical work is the illustrator’s nuanced rationale behind this eighteenth-century throwback. 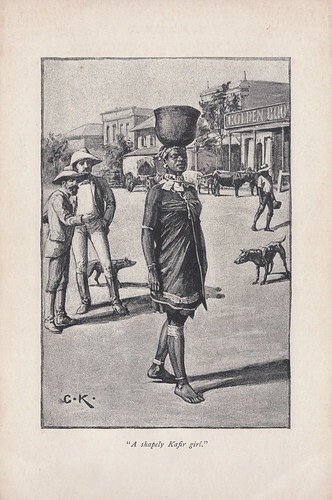 Charles Kerr’s illustration ‘A shapely Kafir girl’ further complicates the European objectification of Africans by the addition of gender (Fig. 3). In The Witch’s Head (1893), an adventure novel concerning an evil witch doctor’s dismembered head, Kerr dramatizes a moment in which two white men sexualize and subordinate the female African body by appraisal. While the men’s eyes and hands gesture actively, the woman’s eyes are symbolically shut. She stands central and erect, proudly withstanding the indignity of her gazers yet powerless to stop them. Perhaps she even enjoys the attention. While this image and caption are extremely offensive, the girl’s face strikes me as compelling because inscrutable. What is she thinking? Where is she going? What is her back-story? What is her name? I would welcome a reinscription of Haggard’s nameless character based on Kerr’s enigmatic illustration. Perhaps a Neo-Victorian ‘Safari Punk’ artist may someday create that new narrative. These examples from Visual Haggard represent the type of offensive images that accompanied the nineteenth-century author’s South African adventure romances, as well as ways contemporaries might reclaim them. In ‘Should Blacks Collect Racist Memorabilia?’ Henry Louis Gates Jr. considers the ethics of collection, curation and distribution in our digital age. He cites self-described Black Memorabilia enthusiast Gail Deculus-Johnson’s question regarding Jim Crow era ‘Sambo Art’: ‘[Since] some items are disturbing, offensive and hard to believe, [if you collect and display them] are you creating these images yourself?’ Tackling this issue begs the dual digital humanities and Neo-Victorian question of whether digitization recapitulates an image’s nineteenth-century ideology, or whether the online image has become something altogether new. Archives such as Gates’s own Image of the Black in Western Art Archive centralize, catalogue and make these images more accessible; archives that are digital natives exacerbate the ethics of access. The Visual Haggard archive possesses the ability to do as much good as harm. In particular it gives voice to Haggard and his illustrators’ subordinate, nameless, and homogenous native and female peoples. Neo-Victorians can and should recombine, repurpose, and derive inspiration from the many Haggard illustrations. Although ethically suspect in themselves, digitization-enabled access permits nineteenth-century cultural historians and critics to discover, interpret, and highlight contextual nuance. As buried relics Haggard illustrations can never represent more than a reproach to his contemporaries, but in the form of an online archive and with the benefit of critical inquiry, Visual Haggard is full of promise. Dino Felluga, ‘Addressed to the Nines: The Victorian Archive and the Disappearance of the Book’, Victorian Studies, 48. 2 (Winter 2006), 305-319. Liu, Alan. ‘Local Transcendence: Cultural Criticism, Postmodernism, and the Romanticism of Detail’, Representations, 32 (1990), 75-113. Wedgwood Medallion, ‘Am I Not a Man and Brother?’ (1787) from ‘Abolition, visual culture, and popular politics’, J.R. Oldfield, Popular Politics and British Anti-Slavery: The Mobilisation of Public Opinion against the Slave Trade 1787-1807 (London: Frank Cass, 1998), p. 157. Kate Holterhoff is a PhD Candidate in Carnegie Mellon University’s Literary and Cultural Studies program. Her research focuses primarily on the ways in which evolutionary science impacted Victorian and fin-de-siècle romance literature. She is the editor of Visual Haggard: The Illustration Archive, a digital archive intended to preserve, centralize, and improve access to the illustrations of popular Victorian novelist H. Rider Haggard. You can read more about Kate Holterhoff at www.kateholterhoff.com, @KateHolterhoff, and http://carnegie-mellon.academia.edu/KateHolterhoff.